I usually wear glasses when working at my computer and recently my peepers needed a bit of an update so that meant a new pair of eyeglass frames. 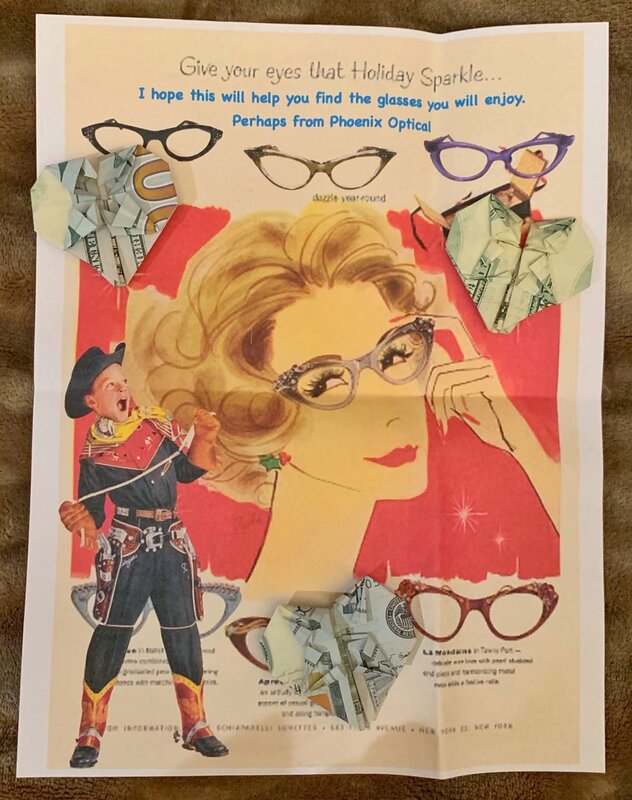 My hubby Gary gifted me for Christmas with new frames from an exclusive eyewear boutique in Petaluma called Phoenix Optical and when I opened my gift I was over the moon thrilled and excited as he packaged it into a vintage 1950s advertisement for glamorous eyewear complete with $100 bills made into origami hearts. I really do have the sweetest and most generous hubby!! 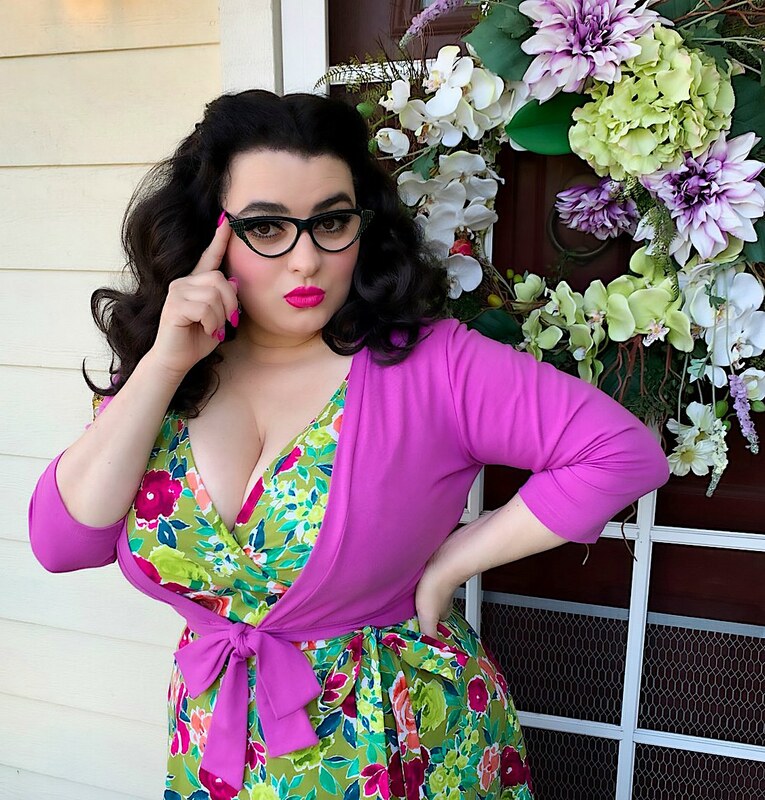 Being the vintage vixen that I am, not just any old pair of frames would do. We stopped into Phoenix optical the day after Christmas and took a look at their high-end collection of frames, which are amazing. The staff at Phoenix Optical is incredibly friendly and knowledgeable working right along with you to fit you with the best frames for your face shape and personality. Phoenix Optical has a vast collection of vintage eyewear dating to the 1930s and they also custom make shapes, colors, materials and finishes. As with most things in life, it is the attention to detail that matters and Phoenix Optical lives up to that. 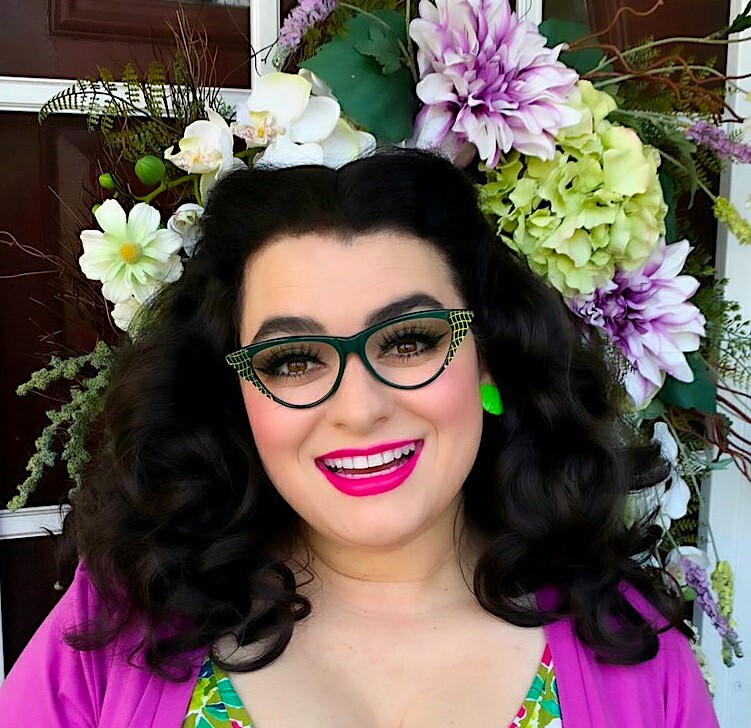 I love retro glamour and all things 1950s so I was immediately drawn to the cateye frames. Phoenix Optical also has a stunning selection of genuine horn and acetate frames and a great retro selection with lots of 1930s-1980s styles. 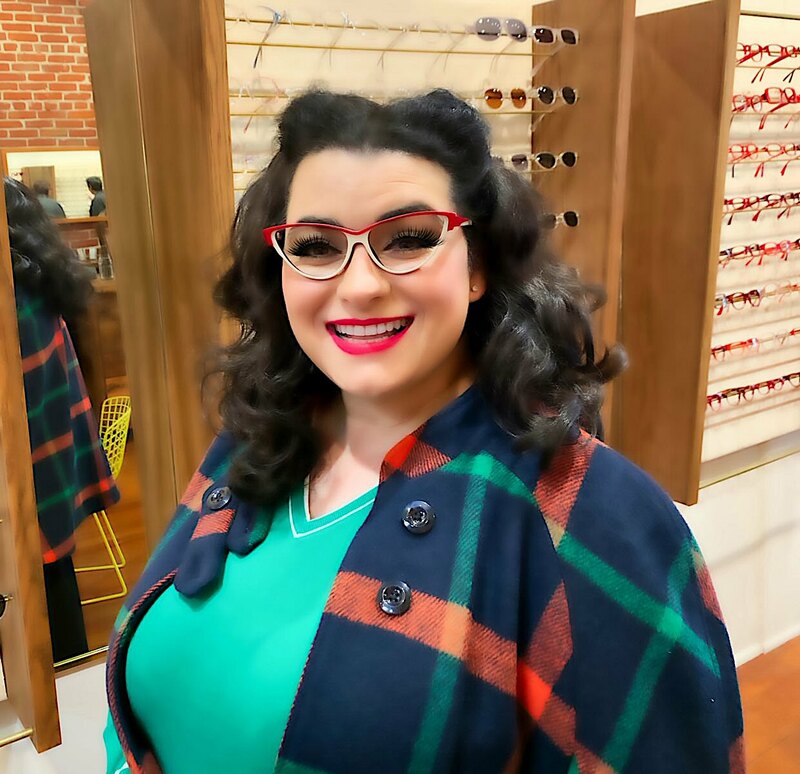 Here I am trying on a few beautiful 50s styles and let me tell you just how hard it was to select a pair of frames. I ended up falling in love with these forest green beauties designed by French eyewear designer Eric Jean in Paris, France. Back in the 1980s Eric Jean was a stylist for Valentino, Oscar De La Renta, Nina Ricci and Alain Mikli. 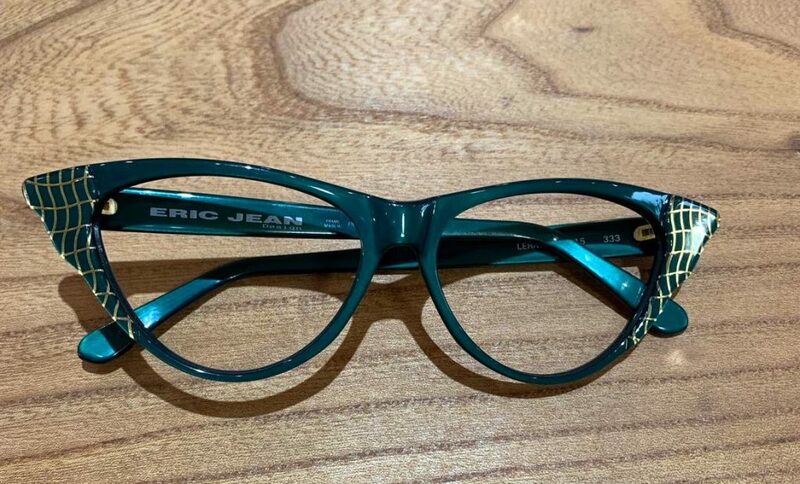 Eric Jean’s eyewear is handcrafted with the best acetate plates, sophisticated color designs, circular geometric patterns and are handmade. The friendly team at Phoenix optical measured my head/face perfectly and was even able to get my lens prescription filled and within a few short days I returned to pick up my glasses. The fit is fabulous, there was no need to bend or twist or adjust, I put them on and they felt incredibly comfortable. Now, I want to wear my beautiful glasses all the time. If you live in the Bay Area and are in need of new glasses or just want to update your eyewear then I highly recommend Phoenix Optical for you to stop in and check out. Phoenix optical has a couple locations to serve you around San Francisco and the North Bay. Let me know which frame(s) you select?? ?